Your first session with me includes time before and after to talk about what your needs are. 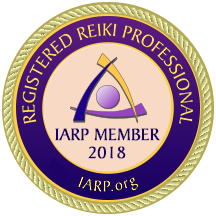 We get to know each other and share information that will help make your Reiki experience one that will not only relax and help destress you, but add insights and helpful hints that will allow you stay on your healing path. Q: What is the goal of Reiki? Reiki is a non-medical, non-invasive means of stress reduction and relaxation. The goal of every Reiki session is to help a person regain the natural, healthful state of balance and calmness, and by doing so, to avoid or lessen illness and conditions that stress can bring on. It is well documented that people who live with less stress live happier, healthier lives! Q: What happens in a professional Reiki session? Generally speaking, when you come for your visit you will be asked to complete an intake form that has a few simple questions on it. From there you are taken into the Reiki room, where we sit and talk for few moments. I like to get to know you, to find out what drew you to seek Reiki , and to determine what can be most helpful for your sepcific circumstance. Every session is different because you are not like anyone else! It’s all about you, and helping you feel better! Once we talk, the session begins. You will hear some gentle Japanese garden music or other meditative sounds. You are placed on the table with plenty of support for your back and head, and soft covers to keep you warm. Reiki is not a massage. Unlike massage, in a Reiki session you remain fully clothed (except for your shoes). Also unlike massage, there is absolutely no manipulation of muscles, stretching of limbs, or other massage-type moves. Reiki is a light touch or hands-off energy modality that allows for a very gentle and restful session for the participant. The Reiki practitioner is trained to know how to check your energy field for the most “wound-up” or out of balance areas. Reiki is administered through the hands, so you may feel a very light touch as the Reiki practitioner moves over your head, arms, feet, etc. In some cases you will not feel any touch at all, as the practitioner hovers his/her hands over you, while Reiki soothes and balances your energy. After the session, you will sit up and then we talk for a bit. I want to hear about your experience In order to better help you to destress in the future. We also talk about things you can do at home to keep your Reiki experience of gentle relaxation lingering on as you go about your life. Personal experience varies, but most people report the Reiki feels like a soothing and calming energy that gentle seeps into their awareness. Sensations of gentle tingling, warmth, glowing and drowsiness are also often experienced. Many people fall asleep, because they are so relaxed! If you have been totally “wound-up” from stress for a long time, you may be very surprised at how restful and calming you feel after a Reiki session.